The wedding cake is one of the most important parts of planning your reception. Everyone loves wedding cake so you want to it taste wonderful and look beautiful. There are so many elements of a wedding cake to consider: the style, design, size, budget, bakery, and more. Give yourself plenty of time to explore your options for wedding cakes and make sure to schedule tastings with plenty of bakeries until you find a cake you love. You should also consult with your wedding caterers about the cake to discuss serving the cake. Take the time to find your dream wedding cake, and if you’re having trouble deciding, think about going with a wedding cake trend. There is always something new and fun to try while still choosing a beautiful cake. 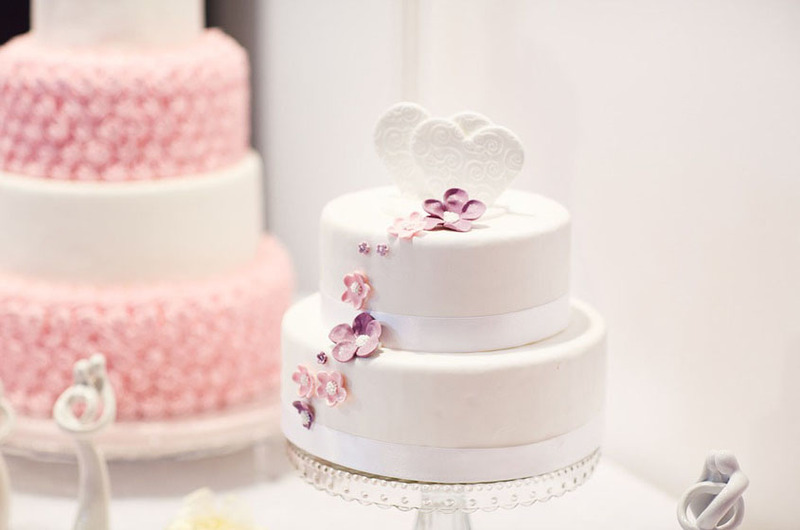 Here are the top 10 wedding cake tips you must know for planning your wedding! Your wedding guests will appreciate the time you took to pick out a delicious cake for them to enjoy. Wedding cakes come in so many different shapes, sizes, flavors, and colors. There is an endless amount of ideas for designing a wedding cake and it can be hard to make decisions about what flavor or decorations you’ll choose. Read wedding magazines or browse on Pinterest for inspiration and then start exploring bakeries in your city to see what they have to offer. Taste the Cake! This is one of the most fun parts of choosing a wedding cake. Deciding how to decorate the outside is a big decision because you want your cake to look beautiful, but most importantly you want it to taste amazing. Your wedding guests will appreciate the time you took to pick out a delicious cake for them to enjoy. Make sure to show up hungry! Match Your Cake to Wedding Details: If you don’t know what you want your wedding cake to look like, get inspired by the details of your wedding. 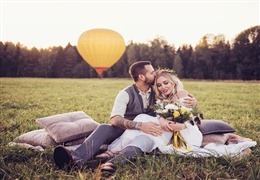 What are your wedding colors? What is the personality of you and your significant other? What does your dress look like? Would lace or pearls be the perfect match for your cake? There are endless options for matching your cake to your personal wedding details. Your wedding cake stand can make a beautiful addition to the look of your cake. You can try a rustic cake stand, elegant cake stand, or tiered cake stand. It all depends on the cake style you choose and your personal taste. Explore your options when choosing a cake stand to decide whether you want to purchase a cake stand or create your own. Your bakery or wedding planner might also have ideas to contribute so keep an open mind and make sure the cake stand is appropriate for your cake. 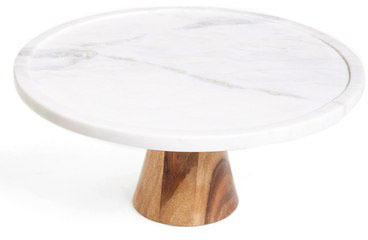 Marble and Wood Cake Stand: This beautiful marble tray set on a wooden stand is a modern and elegant cake stand. If you have a minimalist style or choose a trend like an all white cake, this is the perfect cake stand for you. Rustic Wood Cake Stand: Wood is trending for wedding decorations and rustic themes are all the rage for receptions, especially in the fall and spring. If you decided on an outdoor or rustic wedding setting full of greenery and bright flowers, a wooden cake stand will fit in perfectly with the rest of your wedding decorations. In addition to deciding on a flavor, cake stand, and wedding topper, you must also decide on the other decorations for your wedding cake. You want your cake to match the rest of your wedding theme so consider your other wedding decorations when you plan your cake. 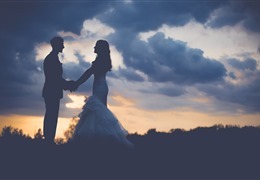 Decorate in your wedding colors, or with lace and pearls to match your dress, or with a theme that matches your personality like a love for travel. The options are endless! Travel Theme Do you and your significant other love to travel? Then try a travel theme for your wedding, including the wedding cake. Have your cake decorator paint on a vintage map or draw icons from the places you’ve been and want to go like Big Ben or the Eiffel Tower. Travel icons also make great cake toppers for this theme. Decorate in Your Wedding Colors: Using your wedding colors makes the perfect cake decoration. Have your baker decorate in sugar flowers to match your wedding colors or decorate the layers in an ombre design in shades of your main wedding color. In addition to all of the other little wedding cake details you have to decide on, you also have to choose a wedding cake topper. There are so many options available from couple figurines to Mr. and Mrs. toppers to personal tastes like the Eiffel Tower if you and your significant other enjoy traveling together. Some cake decorators will have toppers for you to choose from or you can purchase your own. Look for inspiration online and explore unique sellers on sites like Etsy. With so many personalized options to choose from, you can find one that works perfectly for you. Personalized Mr. and Mrs. With Last Name Cake Topper: This personalized wedding topper reads Mr. and Mrs. with your new married last name below. It’s a beautiful and elegant cake topper with a small personal touch and looks perfect atop an all-white wedding cake. Go with a simple and minimalist option by choosing this cake topper. Porcelain Wedding Couple Cake Toppers: This collection of wedding cake toppers shows couples capturing the joy of all the special moments that happen on a wedding day. 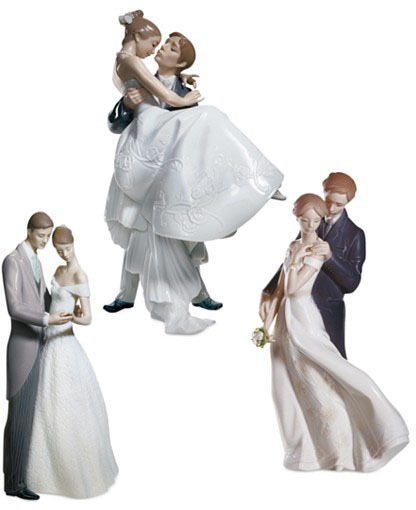 Crafted in porcelain, choose figures dancing, embracing, or kissing for a romantic and stylish cake topper. From decorations to cake toppers and stands, there are a lot of elements that go into choosing a wedding cake. Consider some other ideas like decorating with a current wedding cake trend if you are having trouble deciding on the cake design. There are always new ideas trending in wedding magazines and online sites. Start browsing for inspiration to find alternative wedding cake ideas that suit your tastes and personalized wedding details. 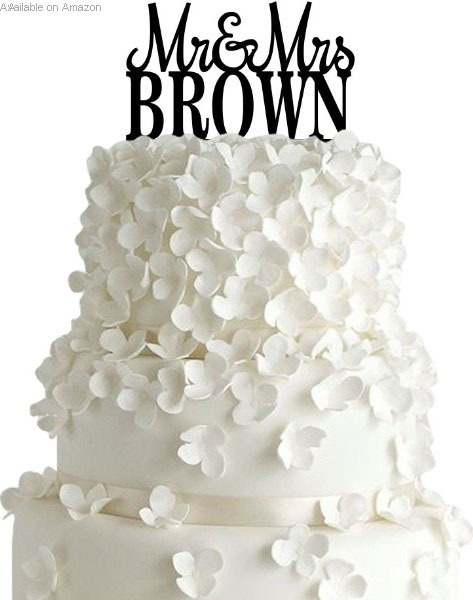 Try a Wedding Cake Trend: Trying a wedding cake trend is a fun way to choose your design and impress your guests. There are a lot of current trends like decorating in ombre colors in shades of your wedding colors, fresh flowers, naked cakes without icing on the outside, or metallic icing for a gold cake. All of these trending ideas make for the perfect wedding cake in the coming seasons. Go All White: Another current wedding cake trend is using all white decorations. This doesn’t mean your cake will look plain, just that all of the details will be in white. Decorate with white flowers, lace, and pearls for beautifully understated details that look elegant, classic, and are a major trend in the age of minimalism. Your wedding cake will be one of the highlights of your reception so put plenty of time and effort into choosing all of the details of your cake. You should consider the style, design, colors, and flavor in addition to extras like wedding cake toppers and cake stands. With so many details to think about, seek outside inspiration online or in wedding magazines and consult with plenty of bakeries to see what their design capabilities are and if you like how their cake tastes. Plus, cake tastings are so much fun for you and your fiancé to pick such an important part of the wedding reception together. There are so many options for selecting a wedding cake so choose the options that are perfect for you and best match your wedding day.